Our newest special collection is the Roger Dale Kruse Collection, thanks to a generous gift from Judge D. Michael Lynn, ’65 named in honor of Judge Lynn’s late partner. The emphasis of this growing collection is on diversity and social justice. 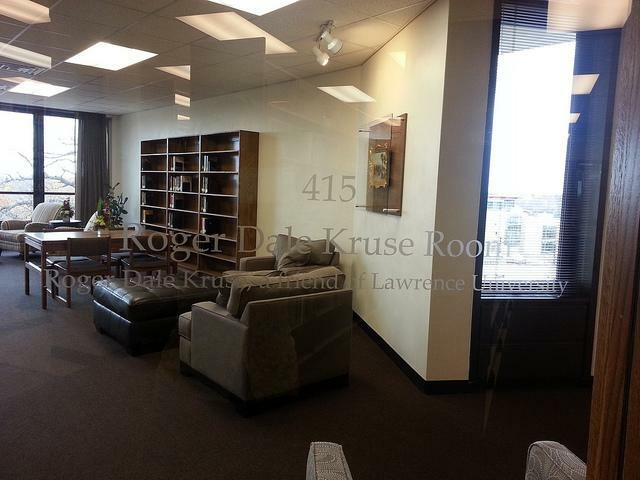 The Roger Dale Kruse Room is a beautiful space in the southeast corner of the fourth floor of the Mudd Library. The funding for renovation of the space, as well as the furnishings and books was a gift of distinguished alumnus, Judge D. Michael Lynn '65. The Kruse Room is a haven for study and reflection as well as a meeting space for students, classes and student organizations interested in diversity and social justice issues. The room was named in honor of Judge Lynn's late partner. And that’s the beauty of this place. For the students, faculty, and staff who read and listen and learn and create and reflect and dream in the library, the Roger Dale Kruse Room is a haven and a home. We’re extraordinarily grateful to Judge D. Michael Lynn for making the Roger Dale Kruse Room happen. Not only did his gift allow us to renovate this space and provide comfortable furniture, he’s donated artwork to enhance the beauty of the space AND he’s provided resources to help us develop a collection of materials on topics relating to social justice, diversity and tolerance. Judge Lynn’s thoughtfulness and generosity will benefit generations of Lawrence students, faculty, and staff and we thank him. In addition to the beautiful art and relaxing furniture, this room also contains a light therapy lamp. Please make sure to read the guidelines located near the lamp before use. For more images of the room, including images from the construction of the space, see our album.